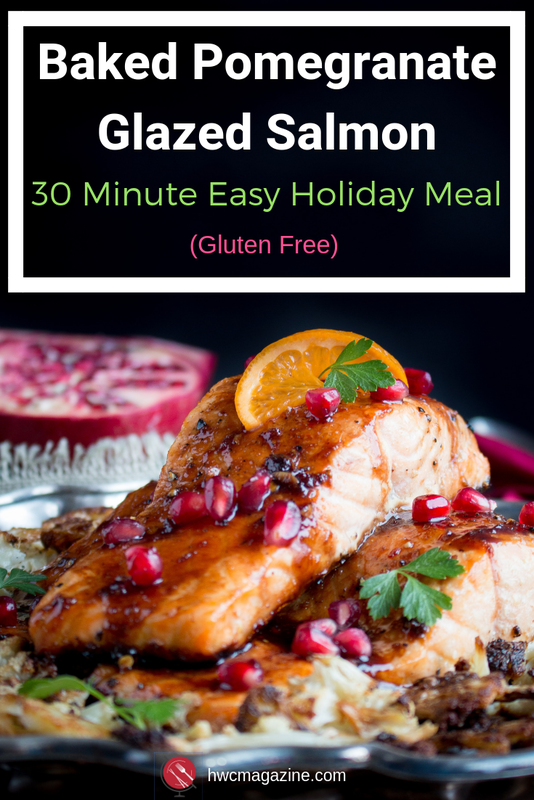 Baked Pomegranate Glazed Salmon is a flaky and succulent fish recipe slathered in an easy sweet, savory, spicy pomegranate molasses orange glaze. 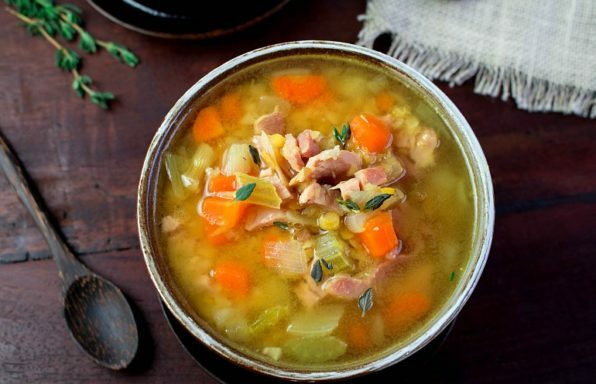 Perfect for the Holidays and ready in under 30 Minutes! 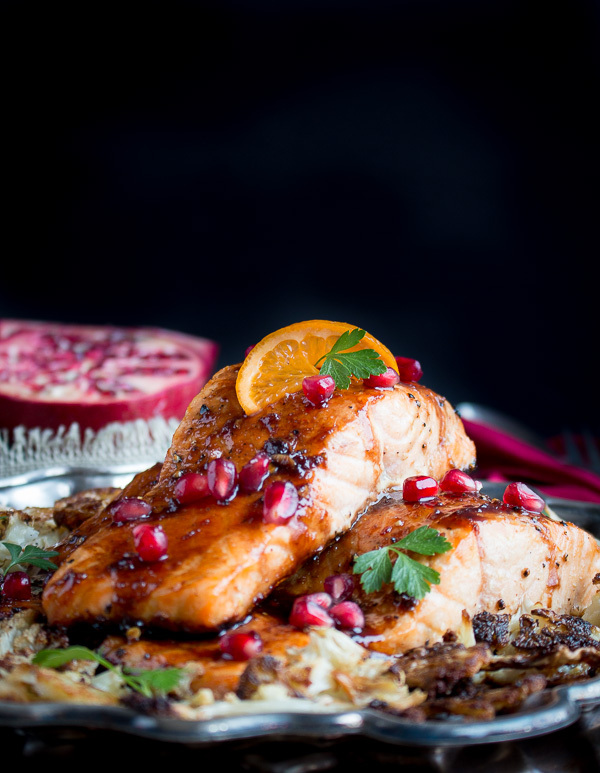 You are going to love this Baked Pomegranate Glazed Salmon recipe as it a snap to throw together, has only a handful of ingredients, easy enough for weeknights but fancy enough for guest. We have you covered. However, one of the reasons why we love it as it celebrates seasonal produce of oranges and pomegranates and is a gorgeous holiday meal. How many of you celebrate the Feast of the Seven Fishes? The Feast of the Seven Fishes is also known as Festa dei Sette Pescior or sometimes La Vigilia. This feast is an Italian-American Celebration of the sea. However, not all of Italy celebrates this feast but some of the southern areas do. An interesting fact is that this celebration has really taken off in America. It might even be more prominent in the US compared to some parts of Italy. Why is the Feast of seven fishes celebrated? Eating fish on Christmas Eve dates back from the Roman Catholic Custom of abstinence from eating meat and dairy on certain holidays, like Christmas. It is much like a fast and a feast at the same time. How did this all come about to be celebrated? We do not know for certain. For some it seems like fish is the cheaper or option for the poorer and meats and cheeses were more set aside for the rich. Therefore, fish is somewhat a fast by only eating fish but is also a feast to celebrate the holiday with family. 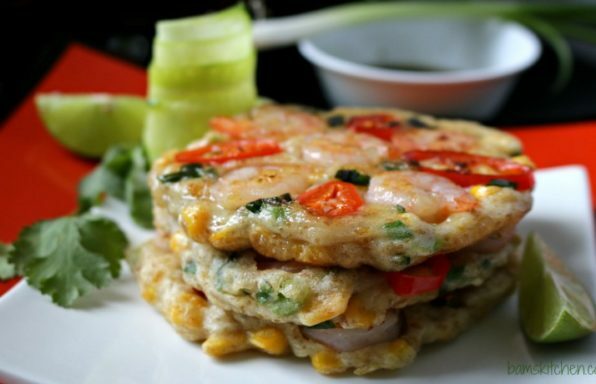 Once again, we do not really know how it all became to be the special 7 fish dishes. Some feel it is because the number 7 was repeated more than 700 times in the bible. There were the seven sacraments, the seven days for the creation and of course the seven deadly sins. Did you know that some Italian families serve up to 12 fish dishes? Some feel that this may be correlated to the 12 apostles? 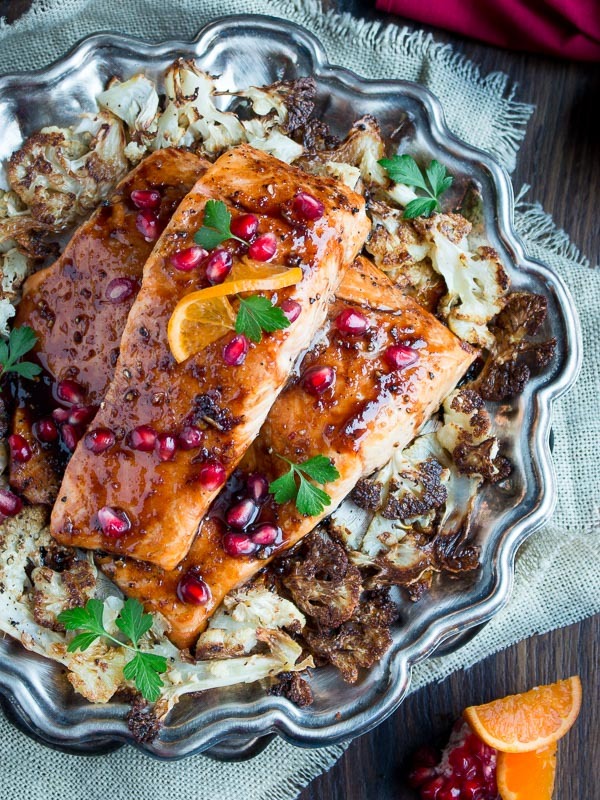 We could speculate on the why for hours but let’s instead concentrate on how delicious this feast is with the addition of the Baked Pomegranate Glazed Salmon. Steaming a whole fish is sublime. However, we know it is difficult to find fresh whole seafood around the world. Therefore, a nice fish fillet is a great option. 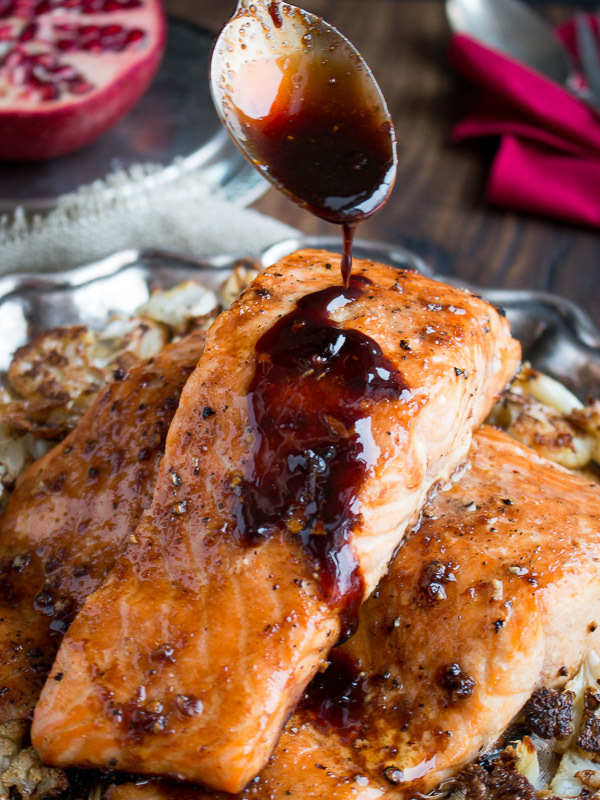 Salmon has a bold flavor and can stand up to the bold flavors of the pomegranate molasses. 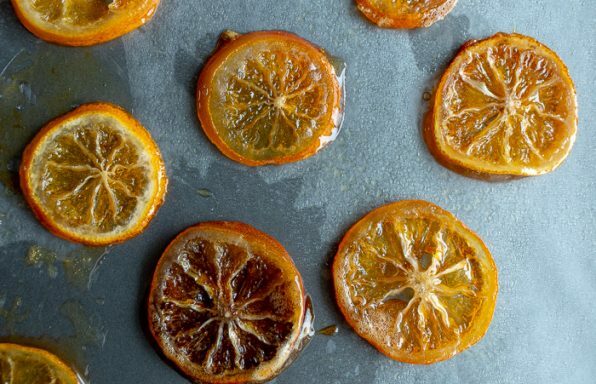 We used delicious Extra Virgin Olive Oil (EVOO) from Mie Radici, seasonal navel oranges and pomegranate molasses to bring this recipe to the next level. 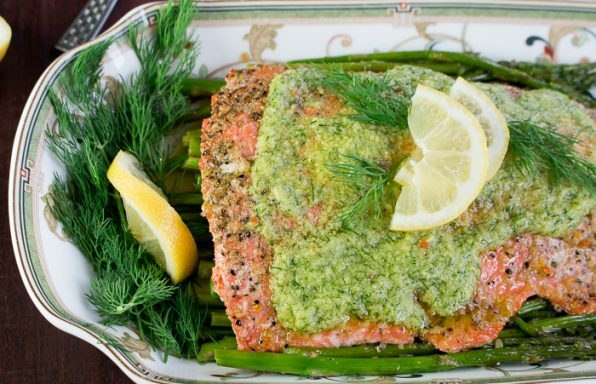 What types of fish dishes do you serve with this Holiday Feast? Mussels, clams and linguini, fried calamari, shrimp, salted cod, antipasti of crudo (marinated raw seafood), and a million other ways. 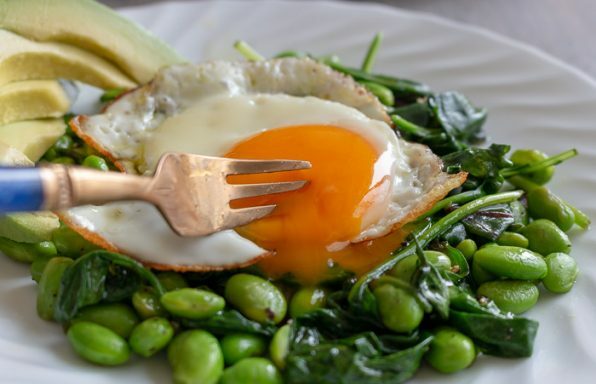 Fried seafood is a common element but we are not real fond of fried foods as your poor little liver must work so hard to metabolize all that fat. Instead, we prefer steamed, baked, sautéed or grilled options for making our fish dishes. How about you? 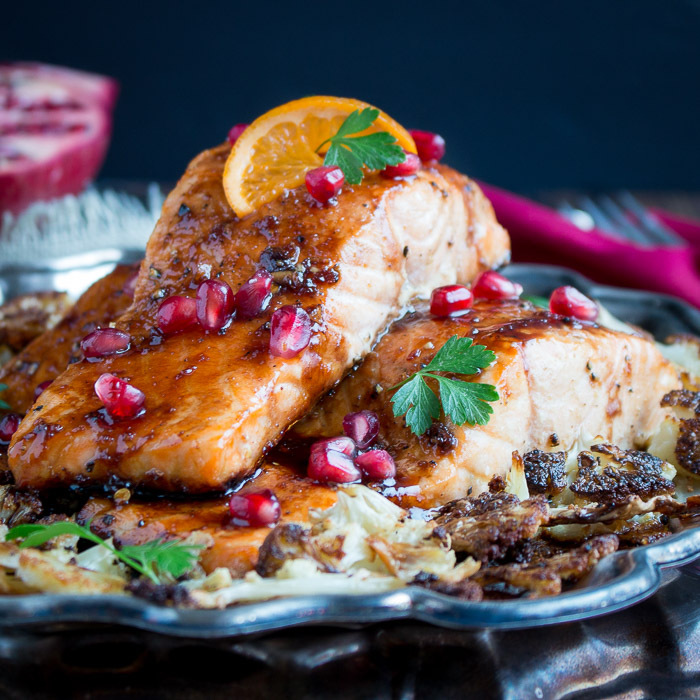 Baked Pomegranate Glazed Salmon is a great addition as it frees up your stove top so that you are free to make your other dishes. 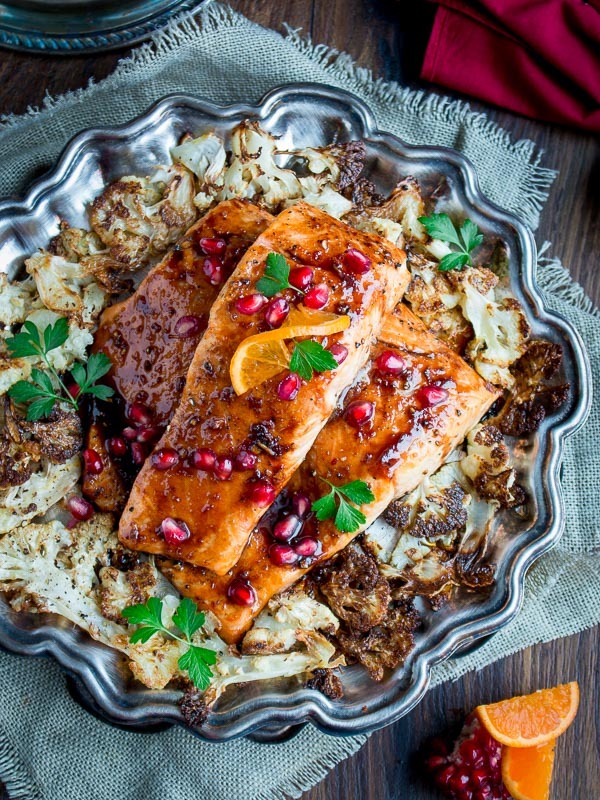 Baked Pomegranate Glazed Salmon is a delicious main. Pomegranate molasses in not a traditional Italian ingredient but is common in the Middle East. That is exactly the point! There are no rules for the feast. Eat what you enjoy and is seasonal. The gathering of the family and enjoying delicious fish and seafood feast and time together is in the spirit of the holiday. We made our Crispy Roasted Cauliflower Bites on a sheet pan before we added the fish as to save on pans and time. A delicious addition to complete the meal. Don’t you just love the crispy ends of roasted cauliflower. The best! 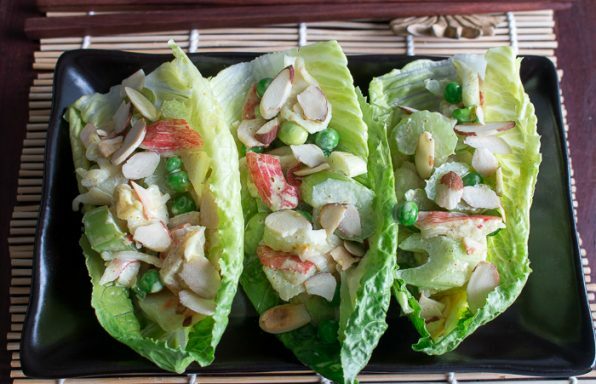 A bright and beautiful Holiday Salad is a delicious addition to this meal as well. Be sure to end your meal with our Chewy Mandarin Orange Cookies or our Rich and Creamy Tiramisu. Wishing your family, a safe and happy holiday season from our family to yours! 1Preheat oven to 425 degrees F (218 degrees C). 3Bake for about 9 minutes (depends on how big your salmon slices are). 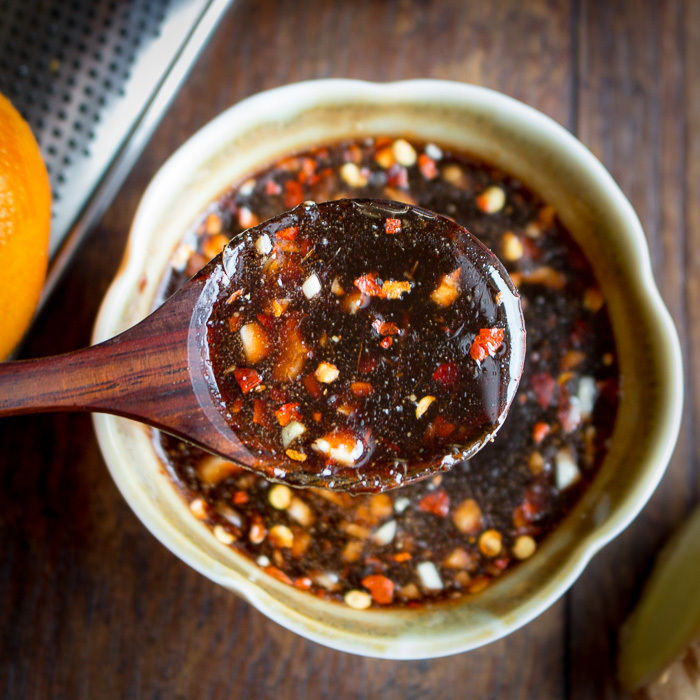 4In the meantime, mix pomegranate molasses, tamari sauce, orange zest, garlic, chili flakes. Set aside. 5Reduce baking temperature to 350 degrees F (176 degrees C) for the last 3 minutes of baking fish. Next, slather over the pomegranate glaze and bake for about 3 minutes. 6Fish is cooked when flakes easily with fork and is no longer translucent (cooking time is determined by the size of your fish fillet). 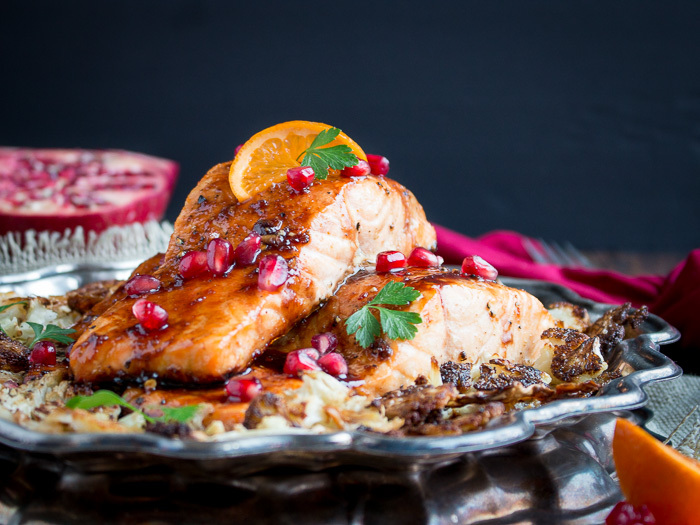 Garnish fish with fresh pomegranate seeds, parsley and orange slices. 8Chef’s notes: Only add the pomegranate syrup in the last couple of minutes of baking or otherwise you will have a smoky mess. If you cannot find pomegranate molasses in the market, you can make your own. Just add 4 cups pure pomegranate juice, ½ cup sugar and 1 tablespoon of lemon juice and cook low and slow until liquid is reduced to about 1 cup without a cover. Takes at least 1 hour. Do NOT over reduce the liquid as it will turn solid when cooled. You are looking for a syrup that just barely coats the back of the spoon as it thickens when it cools.